Part 1: The power to create a successful future. ﻿I don’t know if you have noticed lately, but the world has changed. Business 101 (and 201, and 301) has changed too, and not just a little. Most of the old rules about marketing and building awareness, product development, gaining and keeping customers, and making a profit have pretty much been turned upside down and sideways. Furniture store owners and managers cannot lay back and sleep. It’s time to wake up and get in the game. Today things move and change with unbelievable speed. 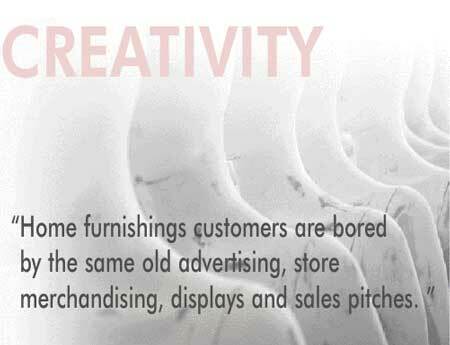 Home furnishings customers are bored by the same old advertising, store merchandising, displays and sales pitches. This is a contributing factor to our industry’s low close rates, and lackluster sales. For your business to move forward and see real profits, creative thought that leads to innovation must be at the forefront of your business existence. You must keep things fresh and alive so people always have something to talk about, and a reason to stay connected to you. No matter what you sell, you have to delight and engage your people. This short series of articles will first delve into the process of creative thinking, then get into some more practical guidelines for fostering creativity in your organization. The last installment will include an 8-step process for monetizing your creative efforts. In the past, you may have looked at some of the important research and studies on the types of thoughts and activities produced from the right and left sides of the brain, and the social and economic significance of their application. Today there is even more research to ponder, with some pretty impressive information that we should seriously look at concerning creative people and right-brain thinking. Of course we all use both sides of our brains, but some people FOCUS greatly on right-brain thinking. Research indicates that there is and will continue to be a need for leaders, individuals, and team members who have this talent. What we will learn from today’s markets and today’s scientific research is that creative thinking will be the predominant power force of business and the new economy going forward. For many years a lot of people—particularly heavy left-brain thinkers— played down the value of right-brain thinkers. The right-brainers were thought to be "flighty", not to be taken seriously, a bit off the wall, prone to often changing their minds, and geared towards unusual, out of the ordinary and undependable or unpredictable thinking. Meanwhile, the left-brain linear thinkers were thought to be more valuable, particularly in business settings, since they were reliable, calculated, precise, cautious, and predictable, fostering thinking based on logic and strict sensibility. All along though, right-brainers have shared their ideas and "odd" ways of doing things at the risk of being misunderstood, laughed at, and not financed. Today, however, in this time of changing retail, new marketing, new media, the tribe, connection, interaction, creativity, and off-the-chart ideas, right brainers have come back into fashion. Today is the day of super quick diffusion of ideas, concepts, ways of interacting, new business models, and life-changing products and services. So what if you aren’t hiring right now and your organization is full of left-brainers who have logical, structured, "test it first" and "test it till the cows come home" ways of behaving? Don’t despair. It is possible through a simple shift in thinking to open the eyes of left-brainers to the possibility, beauty and profitability of creativity. Over the last few months, we’ve invested some quality time talking about how furniture retailers can start to build a tribe, and then connect meaningfully with that tribe as a viable business model. Tribe building starts by having a story to tell which helps create awareness about who you are and what you do for others through your business. Communicating your story in an engaging way gets people involved. It encourages them to share your story with others, and this sharing adds to your tribal efforts. Your story needs to be linked to your ideas and your creativity, and to what you offer to your team and your customers. It should speak about the way you do business and address business innovations that are delightful, useful, meaningful, even amazing. Creativity and innovation are key requirements in business today, yet they are very different concepts. Creativity is the ability and willingness to go beyond traditional ideas, patterns, methods, and relationships... through imagination and open thinking... where rules and/or status quo practices are allowed to be challenged and even broken... to create new ideas, patterns, methods, and relationships. Innovation is applied creativity. It is the introduction, diffusion, and/or application of those new ideas, patterns, methods, and relationships. A true innovator enters the creative process with the intent of bringing a great idea to fruition. In business, innovation means that the use of your ideas creates excited, happy, thrilled, or satisfied (at the very least) customers. Some people never embrace creativity, and even fewer embrace innovation, or the implementation of creative ideas. The creative process can be a lot of fun. Innovation (and the diffusion of innovation) on the other hand, takes a certain kind of tenacity and fortitude, and resources too, because it involves strategic planning, troubleshooting, formulation, hard work, and building for real life application. It’s no wonder there are more creative types than true innovators. Still, it all begins with creativity. Some people fear creativity because it seems to have a dark side: it encourages ideas and behaviors that are outside of societal or mainstream norms. Yet, nothing could be further from the truth. True creativity seeks to benefit society, connects us with others, with nature, and with positive thought. Creative action is often inspired by our need to be a vital and constructive part of this world (even if it is just a small part of this world)—to feel that we have an essential role in it. Once the creative process begins, and good, solid or unique ideas are recognized and begin to be developed, organizational resistance may follow. Many business people and organizational leaders fear and resist creativity and innovation because they fear change. Change is frequently seen as a loss of control. Often leadership and management see change as a threat, even before they have looked at the real possibilities of a profitable opportunity. Sometimes this fear has a certain amount of soundness, particularly if a creative idea seems flawed in some way, perhaps in its application. For many leaders, instead of continuing to listen, observe, brainstorm, develop, and trouble shoot, it is easier to just drop the idea before it requires resources. This can be business suicide. Although some business leaders do allow for creativity and the initiating of new ideas in the workplace, many are not fully committed. It is not enough to invest in innovation initiatives. We must invest in the carrying out of ideas that stand a great chance of changing our businesses for the better. Without this intention, spending any resource at all on innovation initiatives (basically brainstorming and creativity sessions) is a total waste of time. Creativity starts with the willingness to listen to your own ideas and to the needs, thoughts, insights, and wants of your target customers, potential target customers, and your workplace team. Tribe members across the globe are now interfacing with a world that moves fast and thrives on change. Tribe members are learning to look for the unusual, the thrilling, the out of the ordinary, and the very useful. The world has opened up. Our target markets and work associates have greater access to new ideas and the people behind them than ever before. Home furnishings retailer owners and leaders who understand this concept will be able to tap into their own creativity and the creativity of others, birthing new products, new services, and better processes that excite and engage people. Your workplace should provide an environment where creativity and original thinking are seen in a positive light and are the backbone of the workplace culture. Customers as well as team associates should know that your organization is cutting edge because you value right-brain, conceptual thinking. The September/October 2010 issue of FURNITURE WORLD will continue this discussion of creativity with a look at how to encourage this attribute in yourself and your employees. It will also present best practices for implementing your ideas, and give an 8-step process for monetizing your creative efforts.